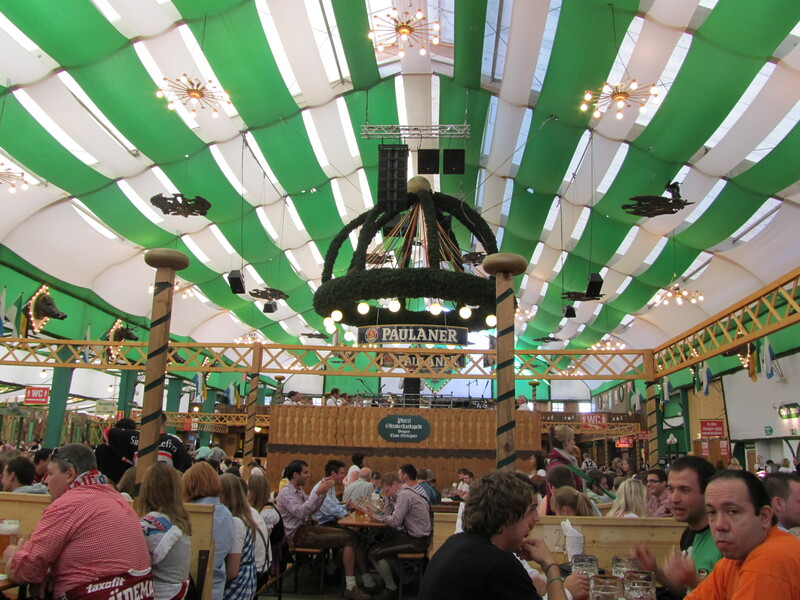 This was our second full day in Munich and we (I) had decided the night before that instead of going to any of the other day trips or sights around Munich that we would give Oktoberfest another shot as it was just that one prick of a ‘man’ that ruined it for us the day before. And also as it was the last day, people would have to be leaving that day so they could be back at work the following day so it wouldn’t be as busy either. This time, we headed straight there. We arrived at about 10:30 and had a short walk around before finding a beer hall to sit in. It was much less crowded and a bit cooler this day as well so we walked right in without a problem. When we sat down, me and dad ordered a stein each and the others some soft drinks. Didnt take us long to find out we couldn’t have picked better seats. Firstly, I couldn’t hear a single Aussie accent other than our own. Secondly, there was an ice hockey game between Cologne and Munich that day and we had sat ourselves right next to, not only their travelling supporters, but one of the 4 owners of the Cologne club. They had left Cologne that morning at 3am or something and had been drinking since then. It was 11am and they were into their 8th hour of drinking and partying with about 5 hours more to go; that’s if they lost. If they won it would go far later than that I imagine. They were your classic loud but harmless European sports fans with all the chanting and shouting and just having a great time. I didn’t think that at 11:00 there would be any atmosphere so my family would be missing out on a huge part of Oktoberfest but these guys made it all worth it. I ordered a second stein, Chris and Cass had pretzels and dad and I had some bread with cheese and ham melted onto them. All classic Oktoberfest foods and we watched plenty of the roasted half chickens go past as well. When we left at about 12:30, I was, well pretty…. Put it this way, 2 steins is enough to get anyone going. The difference is most people who have 2 Steins of strong Bavaria bier don’t then go and do a 3 hour walking tour in the increasing heat of the midday sun. Yea it started to hurt a little and was trying to look after myself with food and water for half the tour. The tour itself was good. 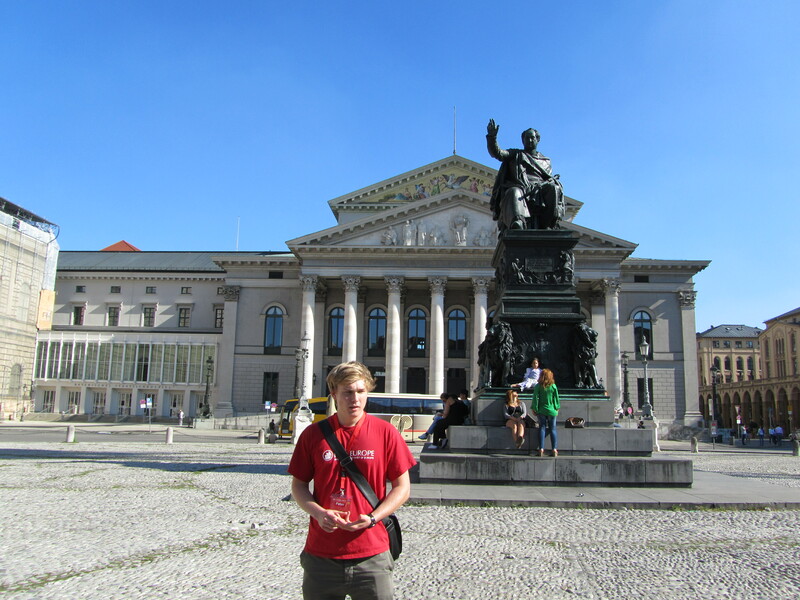 I actually learnt a lot about the Prussians and the first unification of Germany as well as Hitlers’ rise to power. I kind of guessed that our guide hadn’t done may tours yet and at the end he said it was only his second tour but he did pretty well considering. Oh and he was also German born with so English was his second language. So pretty good really. When the tour finished, we commenced our now well rehearsed tradition of relaxation which was to find somewhere that sells coffee and sit there for a minimum of 30 minutes. I also had some food. After walking around for 3 hours, I was feeling a little less drunk and little more hungry. When we had our ritual, we did some wandering around the old town again, just having a look to soak up a bit of time before heading back to the house. For dinner, we had bought some turkey (the others thought it was chicken) and i had made something of a chicken (turkey) carbonara. I doubted that it would work out at all just because i had never cooked it for that many people before and couldnt remember the words for some of the ingredients i wanted. I had to improvise a little but it actually turned out pretty good. So turkey carbonara will probably become a regular item on the Law family dinner menu from now on.